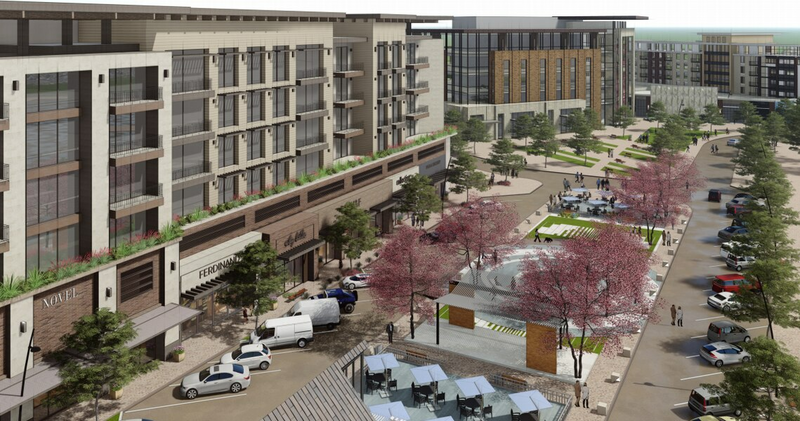 (Rendering by Woodbury Corp.) An aerial rendering of Holladay Quarter, a controversial development proposed for on the former site of the Cottonwood Mall in Holladay. This week’s Utah Supreme Court ruling on a controversial development in Holladay has sparked concerns about the state’s ongoing housing shortage and the prospect of more high-density residential projects being approved by cities, then overturned at the polls. The high court ruled that the Holladay City Council’s approval of a zoning master plan for the mixed-use development at the old Cottonwood Mall site made new law for the suburban city, giving its residents the right to challenge the move in a grass-roots referendum. The court’s decision, which effectively let stand the results of a Nov. 6 citywide vote rejecting the project, is a potentially fatal blow to the $560 million, 57-acre development known as Holladay Quarter. Developers Ivory Homes and Woodbury Corp. had won approval for a massive complex of office towers and retail outlets combined with a 775-unit high-rise apartment complex and 210 single-family homes near 4800 S. Highland Drive. The justices found that city leaders acted in a “legislative” capacity in adopting the plan, as opposed to simply applying existing laws in an “administrative” fashion, as city officials had argued. Along the way, the Supreme Court offered a limited guide to other cities when vetting future high-density residential projects such as apartments and town homes as they seek more housing. Holladay’s approach to the project — adopting a site master plan for development on the land, coupled with a contract with developers to govern their work — is now fairly common among Utah cities. Seeing elements of that overturned worries many city officials, business leaders and developers who had hoped the Holladay case would map a path for making zoning decisions without undue blowback from residents. Derek Miller, president and CEO of the Salt Lake Chamber, noted in a statement that the ruling comes just as the chamber has been working with business groups and leaders in cities in Utah’s fastest-growing counties to improve access to affordable housing amid estimates the state lacks as many as 55,000 dwellings. “Smart growth” refers to an approach to urban and transportation planning that fosters a mix of building types and housing options, and focuses growth in pedestrian-friendly urban centers to avoid sprawl. “There’s just not an understanding of what density really looks like, how it can be managed and the difference between ‘density’ and ‘crowding,’ ” said Stephen Goldsmith, associate professor at the U.’s Department of City & Metropolitan Planning and Salt Lake City’s former planning director. Others cautioned against taking the Holladay ruling too far. Talk of using the court decision to justify major changes to Utah’s referendum laws is alarming to at least one key organizer of the Holladay initiative. Stohlton also said the Holladay debate was being distorted by the issue of housing demand in Utah and the idea that growth is inevitable. A top lobbyist for Utah’s 248 cities and towns warned against conflating the Holladay ruling with other recent disputes in Utah over density, including Olympia Hills in southwest Salt Lake County and a student housing development in Orem. Even amid several high-profile disputes over density, Diehl said, more multifamily dwellings are now being permitted and built in Salt Lake County than single-family residences. And the Holladay decision, he said, does not offer a clear-cut test of which city actions on zoning might face challenges at the polls. Holladay City Attorney Todd Godfrey agreed the ruling did not provide a “bright-line” test on the legislative vs. administrative question. But he noted that the city’s approach on the Holladay Quarter project — using less-proscriptive zoning to give developers flexibility to react to market forces as they build — is likely to be viewed as legislative in the future. In its 17-page ruling, the Utah Supreme Court was explicit that its findings centered on the circumstances in Holladay — while also spelling out some guidelines for other cities on what moves might be considered administrative or legislative. But not every site plan approved under zoning ordinances will be legislative. In Holladay’s case, justices wrote, the special mixed-use zoning it adopted for the 57-acre former mall site became a sort of lens through which city leaders decided how the development would fit with the rest of the community. In that way, they wrote, the zoning “expressly invites the weighing of broad, competing poliçy considerations,” giving it wide effect, beyond specific developers or plots of land in Holladay, and taking it into the realm of lawmaking. City zoning decisions that are “open-ended” and that don’t refer to “fixed criteria” could be considered legislative, the ruling said. But city decisions that apply existing law to individual developers seeking zoning permits or are limited to evaluating specific rules would be administrative. Justices drew on their 2013 ruling in a Saratoga Springs case in which a financial-services firm sought to develop 77 “mansion-style” town homes on a 12-acre plot rezoned for medium-density residential development. Residents pushed a ballot initiative and the developer sued the city. In that case, the Supreme Court found that even though that rezoning affected only one piece of property, it applied to all present and future owners of the land, giving it scope that was broad enough to be considered legislative and a viable target for a referendum.